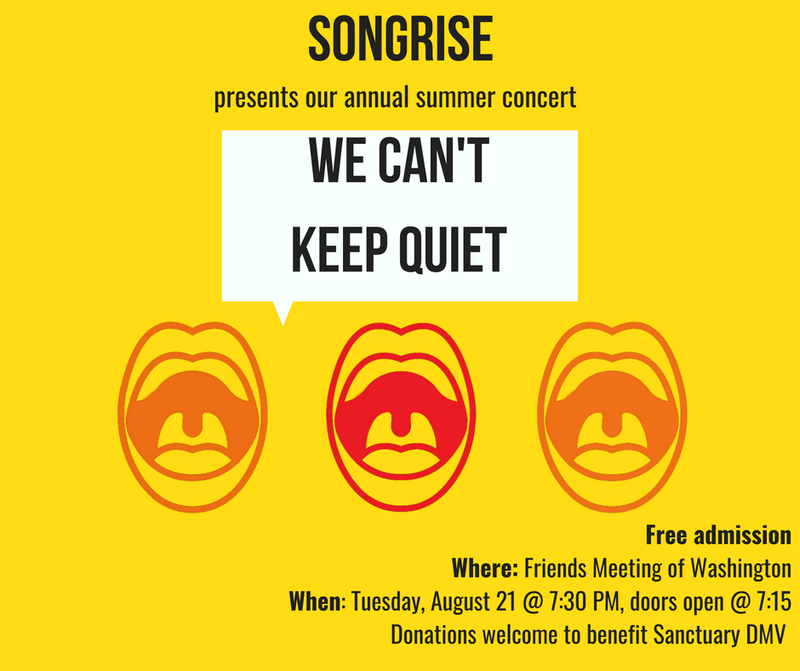 Join us for our Annual House Concert! Our theme this year is "We Can't Keep Quiet", and we hope you won't either. The line is drawn from MILCK's "Quiet", and represents the need for all of us to rise up and speak out, because we together we will be heard and hold perpetrators of injustice responsible. Donations can be made here to benefit Sanctuary DMV's efforts to offset the legal costs of those detained in last month's raids. Sanctuary DMV is dedicated to protecting immigrants and targeted communities in the DMV (DC, Maryland, and Virginia) areas. Sanctuary DMV is a solidarity group that pledges to resist policy proposals to target and deport millions of undocumented immigrants and discriminate against marginalized communities including those who are black, indigenous, Muslim, latinx, and LGBTQ+. Commonly associated with the successful textile strike in Lawrence, Massachusetts in 1912 (often known as the "Bread and Roses strike"), the slogan pairing bread and roses appealed for both fair wages and dignified conditions. Sam Cooke's early 1960's hit about his personal experiences with racism became an anthem of the civil rights movement. His lyrics still resonate today as we push forward in our fight for justice and equality. Released by Dionne Farris in 1994, "Human" urges us to accept that our differences are what make us human, and to embrace the diversity within and among us. In "Behind the Wall," Tracy Chapman speaks about the cyclical domestic violence of a married couple through the perspective of their neighbor, and the futility of calling the police for help. 2018 marks the 30th anniversary of its release. Based on an African American spiritual, "Ain’t Gonna Let Nobody Turn Me Around" became an anthem of the Civil Rights movement for its joyful declarations that nothing and nobody can turn someone from the path to justice and freedom. Let's keep in touch! We respect your privacy.